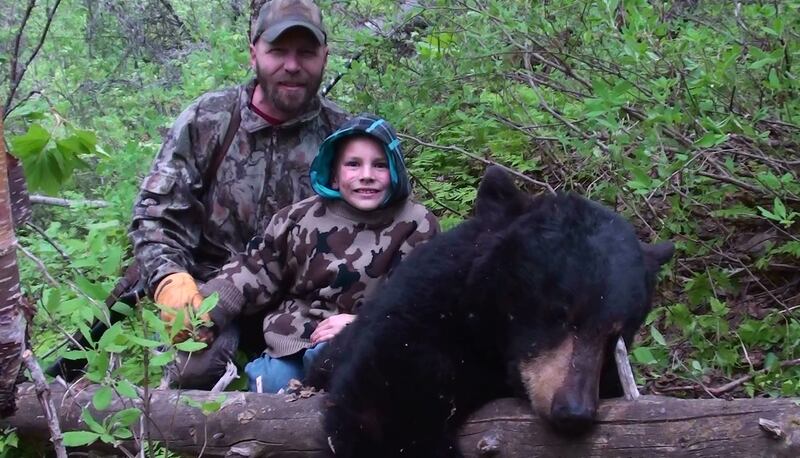 These are truly one of a kind Alaska black bear baited hunts. Top Gun Treks has exclusive bear hunting rights on over 41,000 of private land in Unit 16B. We have 10 working bait stations in 2018 and all of them have active black bears hitting them daily. You can expect to see black bear in the 6-7 foot class. 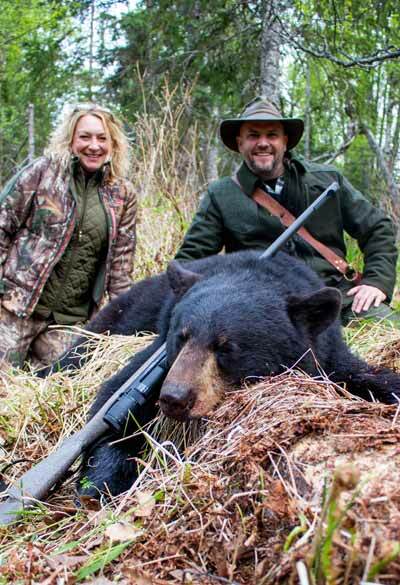 These are one of a kind Alaska black bear baited hunts. 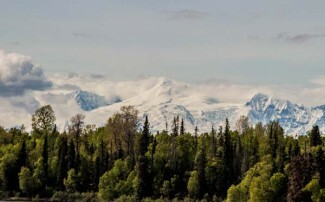 Arrival Details – Fly into Anchorage and rent a car or take a short 8 mile taxi or Uber ride to Merril Field Airport where you will catch a 30 minute commercial flight out to the lodge via small plane. We will meet you at the plane and take you to the lodge. Current regulations allow you to hunt the same day you fly, so you will be on the stand the same evening you arrive. 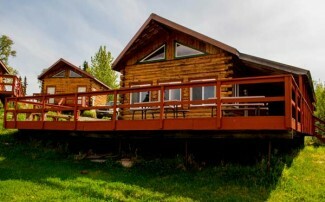 The Lodge – The lodge is located on a scenic lake with mountain views. 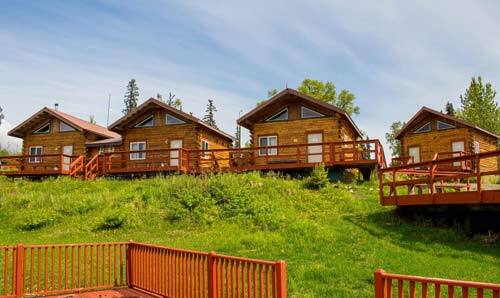 There are 4 cabins, each with it’s own bathroom and shower next to the dining hall and lodge. 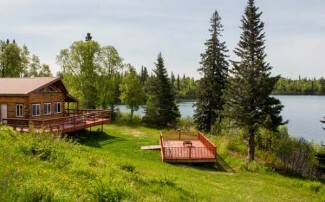 The lodge is equipped with a sauna and a fire pit on an outdoor deck overlooking the lake where you can relax to the sound of loons and bald eagles. • Amazing Alaska Bear Hunting Opportunity! Our black bear bait hunt stands are VERY busy with almost non stop bear activity. From mid May to the end of June it is very common to have multiple black bears hitting bait stations throughout the day, sometimes showing up at the same time. We have trail cameras on every bait station and our guides keep good record of where and when black bears are showing up at the baits. 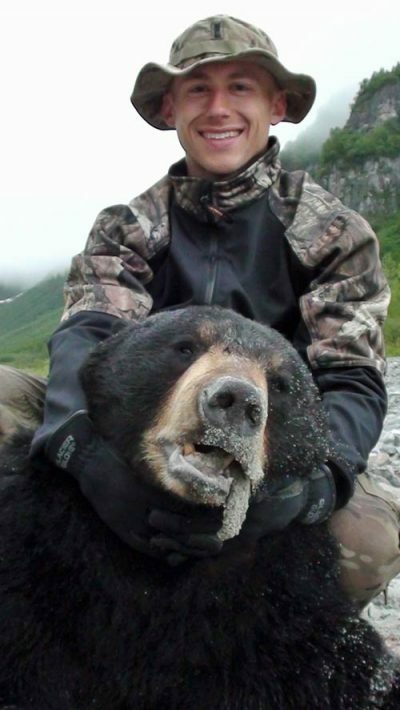 These black bear bait hunts are perfect for bow hunting Alaska black bears. We have several stands that are set up perfectly for bow hunters. NOTE: These are introductory rates for TGT bear hunts during the 2018 season only. Fish for silver salmon and hunt bears along salmon streams. The current Unit 16B hunting regulations allow both resident and non resident hunters to harvest 2 brown bears and 3 black bears per year. We offer the option to hunt a 2nd brown bear or black bear for an additional fee to be paid up front. These special brown bear and black bear hunting regulations are unique because non-resident hunters are now allowed to hunt brown bears over bait. We do not know how long these rules will stay in effect so, we encourage you to book your Alaska brown bear bait hunt today. The lodge can handle groups of up to 18 people and provides a great environment for groups of friends, corporate boards or staff, leadership teams, client or employee incentive or reward programs, team building, or training retreats. Our team will host these events and provide a perfect mix of bear hunting, silver salmon fishing (in August), and other activities. We can also provide experienced business leaders and church leaders who can provide leadership training or inspirational teaching, or business related teaching. Call for special rates for groups of 4 or more booking at the same time. This is the perfect set up to bring the entire family for the hunt of a lifetime. The lodge and cabin configuration is perfect for families and our bait stations are set up in a way that makes it possible for kids, spouses, grandparents, or others to successfully harvest an Alaska bear with minimal stress. We drive to the hunt locations and walk short distances on easy trails to get to the stands. We normally see lots of bear activity, which is perfect for kids, keeping them interested until the right bear comes in. Call for special rates for families of 4 or more booking at the same time. Trophy Care – Our guides will skin your brown bear and/or Black Bear and remove the skull and feet. The hide will be fleshed and salted in the field to preserve your trophy until it can be transported to a taxidermist. Top Gun Treks owner and registered guide Bob Jewett is also a taxidermist and can be hired to do any type of taxidermy work. What We Povide – Accommodations and food at the lodge, 10 functioning bait stands equipped with trail cameras, ground transportation once you arrive. What To Bring – Hunting license, brown bear tag, gun/bow, bullets/arrows, personal gear, binoculars, clothing, rain gear. NOTE TO BOW HUNTERS: If you plan to hunt with a bow, The State of Alaska requires that you have taken a bow safety certification in your home state. Don’t forget your proof of certification if you plan to bow hunt!